Here at MHDA we know that every little girl dreams of being a ballerina. It is our job to make sure that your child’s dream comes true, and that it is both memorable and magical. Your child will enjoy a dance class led by a qualified MHDA dance instructor, and participate in ballet crafts and activities. Then continue the fun in our decorated party room with space for your cake and presents! Dance attire welcome but not required. Children may attend in loose comfortable clothing and ballet shoes or bare feet. – 45 minute ballet class with a MHDA qualified dance instructor. – Ballet Craft, Dress-up and Ballet Games, led by a MHDA Party Coordinator. – Princess Tiara for the Birthday Girl! 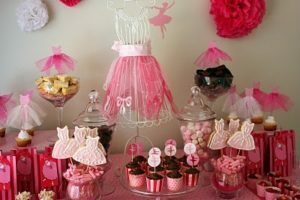 – Use of a decorated room and table for cake and presents. – Each child will go home with a memorable keepsake craft and a goody bag filled with sweets and surprises. Best of all, favorite stories will come to life as the guest of honor and her friends dress up and perform a dance carefully developed to encourage creativity and excitement. To book your party or for more information, contact us today!